GitHub - yrammos/tmLilyPond: An enhanced LilyPond syntax highlighter for the TextMate editor. An enhanced LilyPond syntax highlighter for the TextMate editor. Want to be notified of new releases in yrammos/tmLilyPond? Enhanced LilyPond syntax highlighter for the TextMate editor. 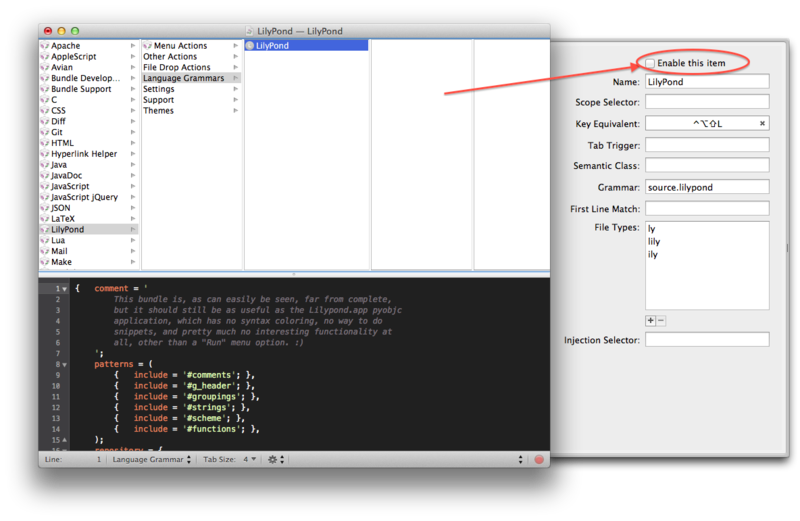 NOTE: tmLilyPond is a TextMate port of my SubLilyPond highlighter for Sublime Text. For screenshots, release history, and other pertinent information, please follow the link above. TextMate currently ships with Jacob Rus's LilyPond.tmbundle, which provides a rather basic LilyPond grammar definition for syntax highlighting. tmLilyPond is intended as a substantial upgrade to this highlighter, adding support for drum mode notation, figured bass, as well as advanced lyrics notation and markup text, among many other refinements. To prevent conflicts between the two highlighters, it is suggested that you disable the original one as shown on the screenshot below. All other features in Rus's original LilyPond bundle (commands, snippets, etc.) will continue to work normally. NEW: Add support for comment and block comment toggling (⌘-/ and ⌘-⎇-/). Copyright © 2014 by Yannis Rammos. This work is made available under the terms of the Creative Commons Attribution-NonCommercial 3.0 Unported (CC BY-NC 3.0) license, http://creativecommons.org/licenses/by-sa/3.0/.